+$Animated short The Twelve Days of Christmas reveals the grim reality of a classic Christmas song. +$A lot of Christmas traditions are quite bizarre when you think about it. Why do we drag trees into our homes? Where does pulling crackers come from? Is there a reason candy canes are associated with the festive period? Only Google knows. +$One of the stranger images associated with Christmas are the lyrics to the Twelve Days of Christmas. Through the course of the endless verses, the song details a ludicrous array of gifts bestowed to the hapless singer. Even in theory the idea of getting dozens of geese and golden rings sounds ridiculous, but this animation produced by+$Anomaly+$imagines how surreal it would be in reality. 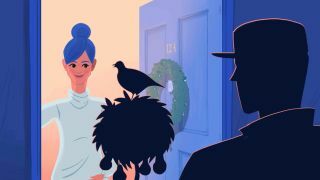 +$Written, directed and produced by Anomaly, the funny short animation stars Phoebe Waller-Bridge as the unfortunate recipient of Christmas gifts that overrun her small London flat. +$Oli Beale, executive creative director at Anomaly says: "At Anomaly, if we find something interesting or funny or entertaining or bird-related, we just like to make it. And we have the people here needed to bring almost anything to life. (Within reason. We’re not going to, like, invent a new space ship or something. But production wise, we can do the full shebang.) This is our gift of entertainment to the nation this Christmas."